When looking for the best DSLR or best mirrorless camera, the question of whether or not it has a pop-up flash isn’t generally a deciding factor. If you’re a videographer, however, having a pop-up LED could play a huge part in your decision – and that’s something you may soon have to consider, if Canon’s latest patent is anything to go by. 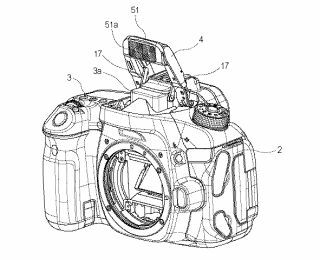 Spotted by Canon News, Japanese patent application JP,2019-056787,A describes “a lighting system and relates to a lighting system with the pop-up function using especially LED as a light source… The type which has what is called a pop-up function for which the lighting system built in a camera moves the type with which the light-emitting part was fixed to the camera body”. In short, this would replace the pop-up flash unit traditionally seen in entry level camera models with a pop-up LED. Whether this would likewise be limited to enthusiast bodies is an intriguing question, since the option for on-board LED lighting could make such a camera very appealing to mid-range vloggers and video shooters. Of course, the big issue would be power. LED lights have a much lower output than flash, and the power of pop-up flash units is already quite low, so an LED that small may struggle to produce a worthwhile amount of light unless you’re working close up in very dim conditions. Of course, for vloggers filming themselves indoors, that may be all that’s required. There’s also the issue of heat dissipation – for an LED to produce a lot of power, or to remain active for a significant period of time, it generates a lot of heat. Interestingly, the patent refers specifically to an SLR-style digital camera. With the already minimized form factor of mirrorless bodies like the Canon EOS R (where heat dissipation was, apparently, already one of the issues that prevented IBIS being incorporated), the company may have to come up with a new design. Still, Canon was one of the pioneers in integrating LEDs to lenses, so it certainly has a background in finding practical solutions for the technology. However, with LED being much more relevant to videographers than photographers, this would appear to be a step towards catering to the needs of video rather than stills shooters. Could we finally see a more video-competent Canon body that delivers uncompromized 4K and a new, dedicated video lamp?